Very few spices have been researched as extensively as turmeric. Talking about that, hundreds of studies have been conducted on curcumin (the most important component of turmeric) and its effects on diabetes. And guess what, the results about using turmeric for diabetes have been extremely encouraging. In this post, we talk about everything you possibly need to know about turmeric and turmeric for diabetes can be helpful. Keep reading. Is Turmeric Good For Diabetes? The curcumin in turmeric has been credited with most of its anti-diabetic effects. 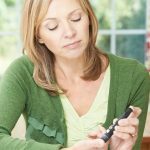 It was found to lower blood glucose levels and even fight inflammation – which is one severe effect of diabetes. One 2013 study conducted by the Beijing University of Chinese Medicine showed how curcumin could lower the glucose levels and help improve other diabetes-related conditions (1). Even turmeric extracts (often found in pharmacies) were found to make diabetes more manageable. And they also prevented other diabetes-related complications like nerve damage and cataracts. But how to use turmeric to manage diabetes? According to a report by the American Diabetes Association, the curcumin extract from turmeric was found to prevent the development of type 2 diabetes (2). Supplementation by turmeric root extract was also found to reduce fasting glucose and insulin resistance. 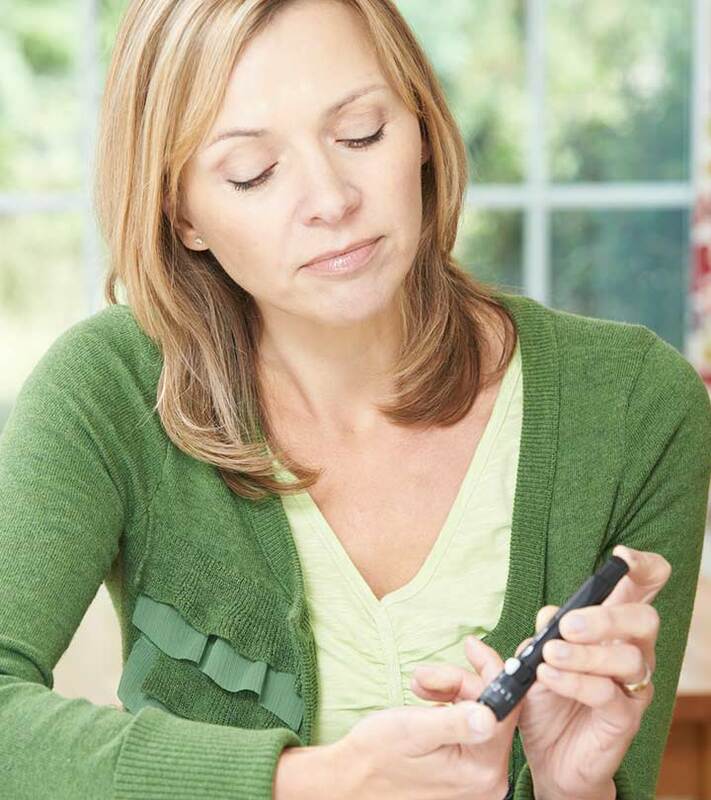 Insulin resistance occurs when our body fails to properly respond to insulin, leading to elevated blood sugar levels. This condition, called diabetes, can be prevented by turmeric root extract. The curcumin in the extract works by reducing the levels of free fatty acids (or FFAs), high amounts of which can interfere with the cells’ ability to receive glucose. The root extract was also found to improve the functioning of the β-cells, which reside in the liver and are beneficial for diabetes (3). You can purchase the root extract from the nearest pharmacy. Or you can also go for the capsules. Check with your doctor before you do so. Gooseberry is often considered a traditional remedy for controlling high blood sugar levels. It also contains chromium, another mineral that regulates carbohydrate metabolism – and this makes your body’s cells more responsive to insulin. Another study talks about several trials that have backed the fact that gooseberry possesses anti-diabetic properties. The study, conducted by the University of Rhode Island, stated how gooseberries could be effective in lowering blood glucose levels in diabetic patients (4). More interestingly, gooseberry was also found to improve cholesterol levels in diabetic patients – and hence can prevent diabetes-related cholesterol issues in the patients (5). You need two tablespoons of gooseberry juice and a pinch of turmeric. Mix the two and have it in the morning. This can help control your blood sugar levels. Cinnamon is another spice well known for its purported anti-diabetic properties. Some reports state mixed reviews regarding its anti-diabetic properties. However, one study had found that cinnamon lowered blood sugar levels by as much as 24% (6). Other research also suggests that cinnamon can lower glucose by boosting the effect of insulin. And cinnamon might also lower cholesterol in diabetes patients. This, along with curcumin’s anti-diabetic and anti-inflammatory properties, can be a good supplemental treatment for diabetes. Another report talks about how a combination of turmeric and cinnamon can lower insulin and triglycerides triggered by high-fat meals. And as per a report by Harvard Medical School, a phytochemical in cinnamon, called cinnamaldehyde, can lower blood sugar levels and ward off diabetes (7). Research has stated that regularly taking 1 to 6 grams of cinnamon for four months can lower the blood sugar levels in type 2 diabetes patients. However, do take care if you have liver disorders – as cinnamon might do more harm than good. Consult your doctor. You can simply mix a pinch or two of cinnamon with the regular doses of turmeric and add to your meals. 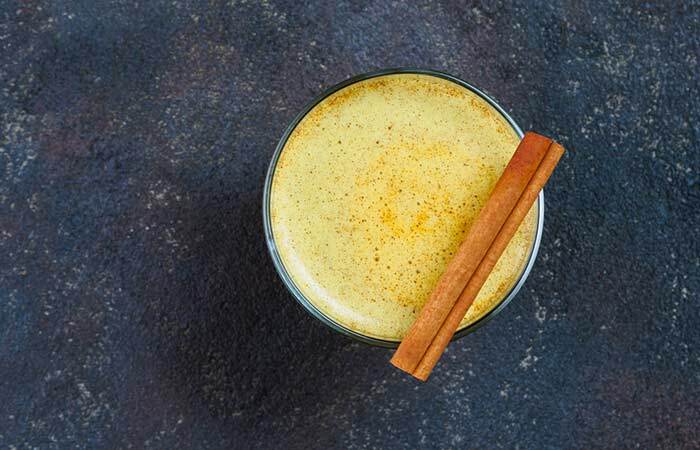 Or you can mix cinnamon with turmeric milk and drink it in the mornings. With honey, there are studies with mixed results. Though honey intake was found to reduce cholesterol levels in diabetics, it was also found to increase blood sugar levels if taken long-term (8). Intake of honey might also have beneficial effects on the body weight and blood lipids of diabetes patients – but ensure you take honey with caution. Honey works exceptionally well in the treatment of diabetic wounds, though. Studies have stated how dressings soaked in natural honey are a great way to treat diabetic wounds (9). Some observations have talked about honey and its desirable effects on type 1 and type 2 diabetes. Honey stimulated insulin secretion and lowered blood glucose levels (10). You can add honey to your food preparations along with turmeric. Adding honey to turmeric milk and drinking in the morning can also help. However, we advise you to exercise caution. Talk to your doctor before using honey for this purpose. Oral administration of ginger powder was found to improve fasting blood sugar (11). One possible way ginger works is by inhibiting hepatic phosphorylase, which is an enzyme that breaks down glucose storage molecules. Also, keep in mind not to use ginger while taking blood thinners as it can have a similar effect. Another study also found how ginger could prevent cardiac ailments often associated with diabetes (12). You can take ginger shots (along with turmeric) in the morning. This can help keep your blood sugar levels in control. One common (and quite serious) effect of diabetes is the damage of blood vessels. 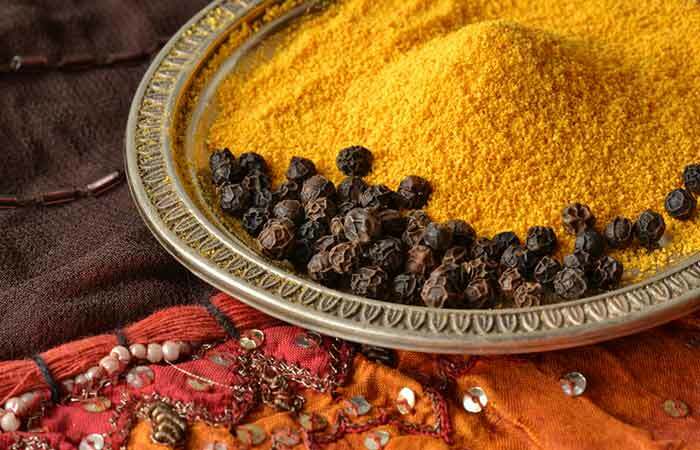 Piperine (one phytochemical in black pepper), along with the curcumin in turmeric, prevents this blood vessel damage associated with diabetes. Studies have also shown that the oil from black pepper can prevent type 2 diabetes and related hypertension. The oil also inhibits two enzymes that break down starch into glucose. Also, the other beneficial antioxidants in black pepper may help stabilize blood sugar levels (13). However, one study states that having curcumin along with black pepper might nullify the anti-diabetic effects of the former (14). Hence, talk to your doctor before using the two to supplement your diabetes treatment. You can add a pinch of black pepper to a glass of turmeric milk and take it in the morning. Or add a pinch of black pepper along with turmeric to your food preparations. Talking about milk alone, there are some studies that have linked regular dairy intake to a reduced risk of type 2 diabetes (15). Another study found that consuming high-fat milk can reduce a person’s risk of type 2 diabetes by as much as one-fifth (16). Diabetes might also increase your risk of bone fractures, which can be prevented with the adequate intake of calcium through milk. But keep in mind that milk also might increase your blood glucose levels – hence, take it in moderation. You can add a pinch of turmeric to a glass of milk and have it in the morning. Turmeric is something you find readily in your home. And it is something that can keep one of the dreadful diseases out of it. Include it in your diet and welcome a healthy lifestyle. Also, tell us how this post has helped you. Do leave a comment below. “Curcumin and diabetes…”. US National Library of Medicine. “Curcumin extract for…”. American Diabetes Association. “Curcumin extract…”. US National Library of Medicine. “A review of the…”. US National Library of Medicine. “Effect of alma fruit…”. US National Library of Medicine. “Does cinnamon help diabetes?” WebMD. “Can everyday spices make you…?” Harvard Medical School. “Effects of natural honey…”. US National Library of Medicine. “Management of diabetic…”. US National Library of Medicine. “Traditional and modern…”US National Library of Medicine. “The effects of ginger…”. US National Library of Medicine. “Protective effects of …”. US National Library of Medicine. 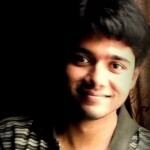 “Recent progress for the…”. US National Library of Medicine. “Piperine, a natural…” US National Library of Medicine. “Adolescent dairy…”. The American Journal of Clinical Nutrition. “Food sources of fat…”. The American Journal of Clinical Nutrition.